It’s anything but “yesterday’s news…” even though we’ve been talking about our HD-BLADE antenna for a while now. This little antenna continues to impress and we were so confident in its abilities that we put it to a real scientific test against the latest and greatest antenna from Mohu, the Mohu Curve. Mohu’s curve antenna seems to be a response to complaints that its original antenna, the Leaf, looked cheaply made and was difficult to mount standing up. Their new antenna is made of hard plastic and has a slight curve to it (hence the name.) It comes with a plastic base to make it possible to mount it standing up. Unlike other products, it’s not reversible. If you don’t like the white color, that’s a shame. We chose the Curve 30 which retails for $50 through various outlets. 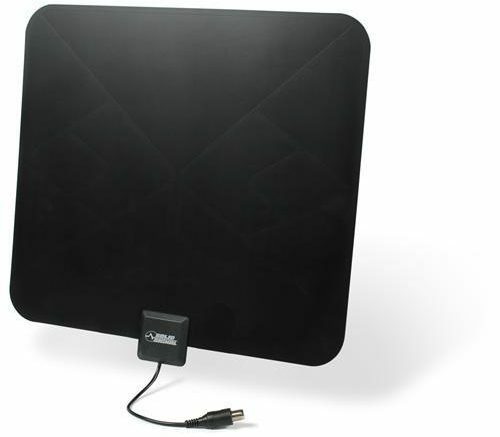 Mohu also makes an amplified version of this antenna for about $90 but honestly we don’t believe that an indoor antenna should ever cost $90 especially when one of our most powerful outdoor antennas is only $60. We decided to test it against our HD-Blade and also the HD-Blade Amped which is closer in price to the Mohu Curve. In theory, the parameters shouldn’t matter as long as they are consistent but we’ll publish them here so you know that we were trying to be as scientific as possible. All testing was conducted at our West Coast Operations Center outside of Los Angeles, California. Testing was conducted indoors with both antennas vertical at a height of one meter from the floor and pointing exactly toward Mt. Wilson where most LA area broadcast signals originate. The test instrument was a Solid Signal DIGIAIR-PRO ATSC meter set to measure digital signals. With a 75 ohm terminator, the instrument measured 31.3dBμV (displayed on the instrument as dBuV) corresponding to -77.45dBm. This represents its lowest observable signal level. The cable used for testing was a Solid Signal custom 3 foot RG6 cable with solid copper center conductor. It had previously been tested for continuity and signal and is believed to be representative of a typical well-made cable. The same cable was used for all testing. The TV used for ATSC channel scans was the Insignia NS19E310A13. All testing took place during the same one-hour interval with sunny skies and no noticeable obstructions, at a distance of roughly 90km from Mt. Wilson, at an elevation of approximately 450m above sea level. All three antennas were placed in the same position and a regular ATSC channel scan was run. Only digital channels were scanned. Channel number totals include subchannels. All observed measurements have been converted to dBm to correspond with TVFool.com’s benchmark readings for those frequencies. Any frequency measurements that were close to the meter’s lowest observable level of -77.45dBm were discarded. There’s no question that the unamplified HD-BLADE performed every bit as well as the Curve. There were a few frequencies that were better on each antenna but the overall results were comparable. However, it’s important to remember that the HD-Blade is roughly half the price of the Curve and produced the same results. The benchmark tuner was not able to pick up as many channels with the Curve. 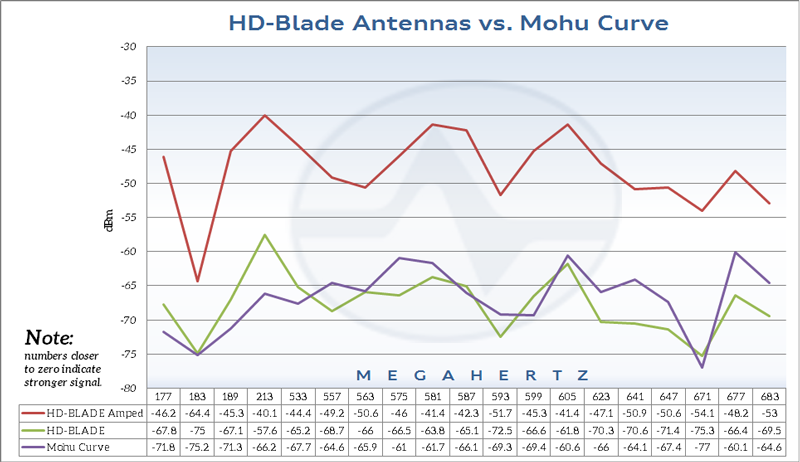 The HD-BLADE Amped which is roughly the same price as the Curve vastly outperformed any other antenna in the test due to its built-in amplifier. The amplifier wasn’t needed for most channels so the channel scan results were not as vastly different as you might think. However, since the HD-BLADE Amped is the same basic antenna, it’s not surprising to see that gain results were 18-21dB higher than the unamplified version. If you want an antenna that looks like a sail, you might feel justified paying twice the price for the same antenna performance. However, if you’re looking for a value alternative with excellent performance, you would be better off with the HD-BLADE or HD-BLADE Amped depending on your needs. A cheaper antenna may not always be the best choice but in this case there is no reason to pay more for the same level of performance. Cutting the cord without an antenna? Big mistake. How often should you rescan for channels if you have a TV antenna? A DVR for antenna TV?